This dissertation investigates the restrictions on weak defi such as in going to the hospital, on bare predicates like in hij is kunstenaar (Dutch, lit. ‘he is artist’), and on bare singular nouns such as in tenir pis (Catalan, lit ‘to have apartment’). These so- called weakly referential constructions are selective in terms of which nouns and noun-verb combinations they can contain. These restrictions are in fact conceptual in nature. The commonly observed intuition is that they can only express concepts that are culturally or contextually well-established in some way, but what this means exactly has so far remained an open question. This dissertation addresses this issue from a semantic perspective, using adjectival modifi as a tool to probe the limits of what can and what cannot be expressed by these constructions. 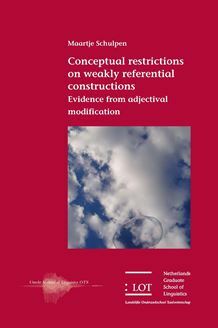 By means of empirical studies of the adjectival modifi restrictions on weak defi bare predicates and bare singular nouns, it is shown that there is in fact a linguistic correlate to conceptual well-establishedness, in that these constructions have a clear preference for adjectives whose semantics is independent of outside factors such as situations and speakers. This shows that something as intangible as conceptual requirements can still be traced back to lexical semantics, showing a link between linguistics and the conceptual level.